Is your teen falling into the trap? Studying IS making study notes. At least that’s what students tell us when we ask them what studying involves. We agree that, in most cases, making study notes should be what your teen spends most of their time doing while preparing for exams. It’s our belief that it doesn’t matter what your teen’s predominant Learning Style is, study notes are a must for everyone sitting written exams. Because study notes are such an integral part of studying for exams, we think all teens should know the pitfalls to be wary of! What type of study notes don’t work? Simply – ones that require no cognitive input at all. Your teen could copy out, word for word, a textbook on molecular biology. Does that mean they’ve understood it? Of course not! They can only really say they understand it once they are able to create a web in their mind about how all the different ideas, concepts and molecules fit together (if they felt so inclined!). We don’t want your teen to just go through the motions and not actually take in any of the information they write down. There’s a danger that writing study notes can become a huge, monotonous waste of time. Your teen needs to know how to avoid this trap. So what does writing effective study notes entail? To make good study notes your teen needs to master the art of paraphrasing. This is because you can’t paraphrase properly without understanding what a sentence means. It requires that your teen read the information, digest what it’s saying, and put it in their own words. This will enable your teen’s brain to make the cognitive connections it needs to in order understand and retain information, unlike copying down words verbatim. Prokaryote originates from ‘pro’ meaning ‘before’ and ‘karyote’ a nut or kernel e.g. a nucleus. 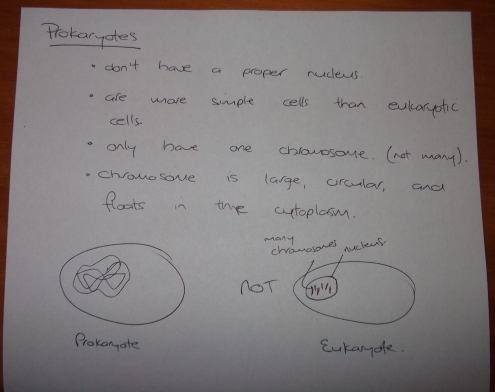 Therefore, unlike Eukaryotes, Prokaryotes do not have a true nucleus but rather store their single, large, circular chromosome in the cytoplasm. You may notice that Chris’ written include some information not included in the passage above. This is what we want your teen to do; To elaborate on the information they read with either stuff they already know, or with information they get from other sources. This will require some lateral reading – using dictionaries, Wikipedia, or simply reading other passages in the textbook – but we can guarantee this is what top students do to get the marks they want.